As part of the Famine Walk weekend, a seminar entitled ‘Food for Thought’ took place on Friday 18th May in Castlebar. It was organised by FEASTA, the Foundation of the Economics of Sustainability and other groups and marked the 20th birthday of the founding of Feasta and the legacy of one of its founders, the late radical economist and author Richard Douthwaite. Mark Garavan of Feasta highlighted the fact that about 100,000 people died during the Famine in Co Mayo – that’s about the size of the population of the county today. He drew parallels between social policy in the Great Famine and the situation today in many powerful countries when he said that in Ireland some £9.5 million was eventually spent on late and poorly designed ‘relief’ during the Famine period while £14 million went to sustain the military and police forces. Keynote speaker Peadar Kirby, in a bilingual address, explored ecological parallels in culture, language and resilience – with a backdrop of the Famine, which he said was often termed ‘an Drochshaol’ (the bad life). He focused on the impending challenges for humanity of the crises of climate change and the extinction of species. He concluded by saying that we will need to draw on various resources including from resources from within our cultural traditions of language and spirituality to deal with these challenges that we face. 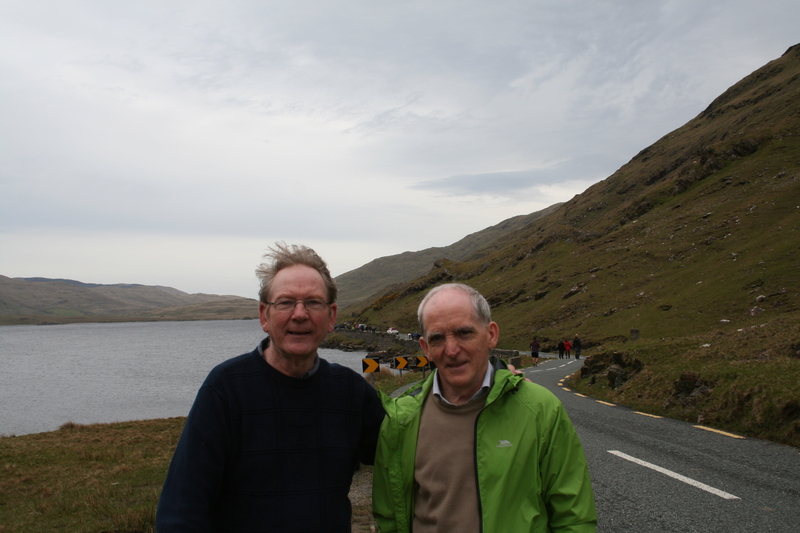 Afri Co-ordinator Joe Murray and Liam Murtagh (Transition Monaghan) on the Afri Famine Walk in Doolough Valley on the 19th May 2018. The fate of people in famine situations and other disasters linked to injustice and oppression was highlighted and reflected on at events in Co Mayo organised by Afri on 19th May. Their 30th Famine Walk from Doolough to Louisburgh is an annual commemoration of the Irish Famine. Afri is an organisation that works on the promotion of global justice and peace, and the reduction of poverty. The Afri Famine Walk retraced a journey of horror which occurred on 30th/31st March 1849. Two poor-law commissioners were to assess people in Louisburgh, entitling them as ‘paupers’ to meagre relief rations. The inspection never happened, but the people were instructed to appear at Delphi Lodge at 7am the following morning. They walked the hilly road in wintry, snowy conditions. At Delphi Lodge they were refused food, or admission to the workhouse, and so began their weary return journey, on which many, even hundreds, died. Afri recalls the dead and displaced of the Great Hunger – and all those facing the same avoidable cruelties in today’s world. The Famine Walk leaders who were selected to represent the spirit of resistance and transformation addressed the walkers in a packed Louisburg Hall before the walk. They included Richard Moore, who was blinded as a 10-year-old child by a rubber bullet fired by a British soldier in Derry during the Troubles. Richard was inspired by his own experience and by Afri’s work to found the charity ‘Children in Crossfire’. Another 2018 walk leader was Fatin Al Tamimi, Chairperson of the Ireland-Palestine Solidarity Campaign. This year is the 70th anniversary of the Palestinian Nakba, when more than 700,000 Palestinian Arabs fled or were expelled from their homes, during the 1948 Palestine war. Fatin spoke about the current suffering of the people of Gaza and her personal desire to be reunited with her sister who is living there. At Delphi Lodge the walkers were addressed by Joe Murray of Afri and by the Manager of Delphi Lodge, Michael Wade who welcomed everyone. After a tree planting ceremony, singer Lisa Lambe gave a haunting rendition of the song ‘The West Awake’ before the walkers started on their journey through the stunningly scenic Doolough Valley and on to Louisburgh. Like the 1849 walkers, not all the 2018 walkers, including myself, could manage the full journey. However, unlike the 1849 walkers we received help in that we were transported for the later section of the journey to Louisburgh. Liam Murtagh is involved in Transition Monaghan and regularly writes a ‘Sustainability Matters’ column in the Northern Standard newspaper.